UPDATE: As per a new order issued by the Environment Ministry, new thermal power plants in India will now have to comply with ‘human health and environment’ criteria as part of their mandatory environmental clearance procedures. This essentially means any company seeking environmental clearance for new thermal power plants will have to take into account chronic exposure to air and noise pollution which may adversely affect health of not only workers but also of people living in its vicinity. However, cleaning up of existing power plants (through retrofitting) needs to be prioritised and the progress needs to be made public, so there's more transparency and accountability. In 2015, the Environment Ministry put in place improved pollution norms for the thermal power industry which required all the thermal plants to become more water efficient and to further reduce the pollution they spew into the air. These included toxic pollutants like sulphur oxides, nitrous oxides, mercury, and particulate matter. These important rules were set to come into force in 2017, but this did not happen. Instead, the Central Electricity Authority (CEA) disregarded the Environment Ministry's rules and gave thermal power plants an extension. The Ministry of Environment, Forests and Climate Change later told the Supreme Court that coal-based thermal plants will conform to emission norms by 2022. Sulphur dioxides (SOx) and Nitrogen dioxides (NOx) are toxic gases hazardous when inhaled. Inhalation of these gases may cause or worsen respiratory diseases, such as asthma or bronchitis, or may also aggravate existing heart disease. The asthma cases in India are already on the rise -- doctors claim that they are now seeing a rise of 60-70 per cent in ailment cases related to pollution. To meet the new pollution norms for SOx the plants are required to install a technology called, flue-gas desulfurization (FGD) which helps remove sulphur dioxide from the exhaust gases of fossil-fuel power plants. Even though the industry had a two year window period to install the required technology, most of the industry began arguing back with the government against the rules once they had been officially notified. High levels of toxic air pollution are a problem plaguing most parts of India for several years now. And thermal power plants are a major contributor to SOx and NOx levels in the country. A study found that coal-based thermal power plant clusters were responsible for more than 75% of total SO2 emissions in all 23 Indian states they analysed, and for more than 90% in 16 Indian states. With over 300 thermal power plants allowed to flout environmental rules for another 2 - 5 years, it will lead to an increase in air pollution levels across the country. Centre for Science and Environment estimates that about 45% of the SOx pollution from the industrial sector comes from thermal power plants. Chembur is a hub for many factories in turn a big chunk of population suffers from the harmful emission of these factories and respiratory disease are common. I do hope for a less polluted chembur for its and it's citizens better future. My name is Bhargav Krishna and I am a public health professional. 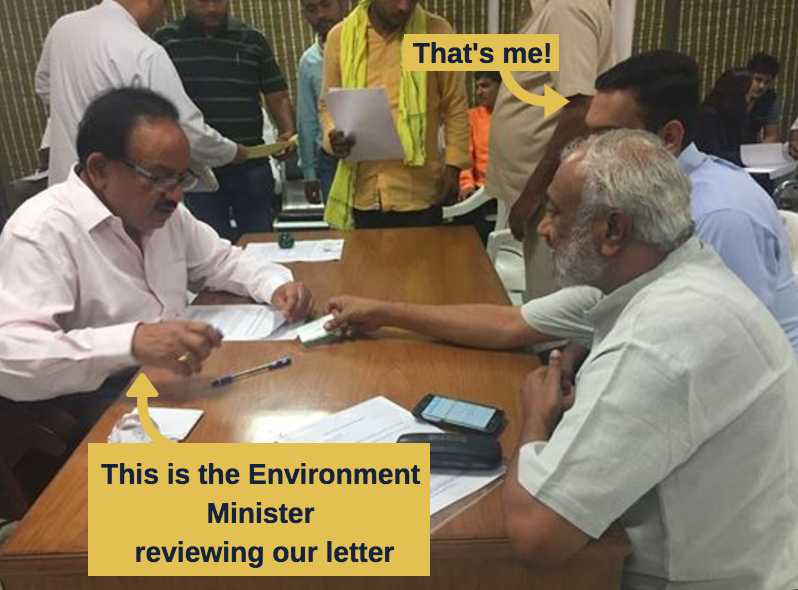 I met with Environment Minister Dr. Harsh Vardhan last week regarding the #airpollutionextension given to over 300 power plants. I delivered a letter on behalf of a coalition including 63 representatives from the medical community and groups working on clean air and clean energy. We strongly believe that the stringent emissions standards must be implemented on schedule and without exceptions to safeguard public health. During our meeting, the Minister agreed that this issue is urgently important and asked us to contact his team. This is HUGE! -- We will be following up with him soon. Jhatkaa campaigners will be meeting with the Minister soon too! And now is your chance to add your name to the campaign -- Sign and share the above petition now!